We can lead better lives in an inhabitable world (for more than just a few decades) only if we chart a less governmental, less voting-based path. 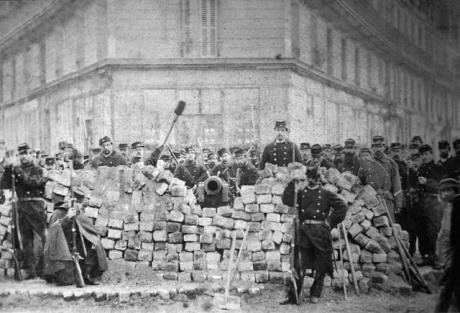 Paris Commune of 1871: barricade after capture by the regular army, where Boulevard Voltaire meets Richard Lenoir. Wikicommons/Bruno Braquehais. Some rights reserved. The financial and housing devastation of 2008, youth underemployment, and ultimately the victory of the radical right at the polls has resulted in talk of socialism in America. Then the talk turned to growing organization, culminating in serious challenges to the democratic establishment. What many mean by “democratic socialism” is an inclusive version of the New Deal (though there are some who disagree). The original New Deal was white and male. LBJ’s attempts to break that mould remained ineffective and led to incurable divisions within the Democratic Party. Today, a revised New Deal can only rise on the shoulders of women, LGBTQ, minorities, and immigrants, who now lead the anti-establishment challenge. They perhaps can become the left faction of the Democratic Party and build a new country. But is this really the way to go? Was the New Deal that ideal? What were its costs? The New Deal delivered stable jobs, homes, roads, cars, and education to an increasing number of Americans over the decades. If not derailed, it would probably have delivered more effective healthcare too. However, the New Deal spelled the end of spontaneity, organizational creativeness, and (more broadly) self-reliance and power for workers and activists. It taught them to look up to the government, parties, union bureaucrats, and corporations for the resolution of their problems. Many of the major actions of the 1920s and 1930s had focused not on wages and benefits, but control and autonomy (which factory rationalizations undermined). Freedom, that watchword of conservatives and libertarians, was at the heart of the protest. These concerns were mostly dropped from the labor agenda afterwards. The “deal” struck with business interests cost the movement its soul. A similar expectation haunts the talk of socialism in our day. We expect to vote well-meaning people into office. Once safely there, they will deliver us education, healthcare, and other rights. Yet, this (seemingly) realistic hope misses a crucial part of the picture: if it were not for factory occupations, general strikes, and other disruptive action, politicians (let alone business families) would never be willing to shake our hands and reach a “deal.” More broadly, they (apparently) gave in because the international threat of communism was looming on the horizon. As they do not face severe internal and external pressures, today’s businesses (and other elites) will surely sabotage any kind of legislative action (even if socialists are elected in large numbers, which is itself unlikely in the absence of extra-parliamentary organization). The actions and organizations of the 1930s and 1940s could have (hypothetically) gone in a much more participatory direction, had only political organizations acted as better leaders. Due to the international balance of forces, however, that was impossible. To the left of the Democrats, a professionally organized Communist Party crowded out all organizations willing to shoulder that task. Despite its earlier (more action-oriented) role, the CP in turn came to be content with entrenched unionization, welfare policies, and (the false promise of) sharing power in Washington DC. What does a revolutionary threat look like? Since “free market” capitalism has failed Americans for a second time now, we are likely to see a (perhaps technologically more advanced, but also more dispersed and directionless) repetition of the 1930s and 1940s. Occupy Wall Street (and its fleeting “assemblies”) was an early sign of what is to come. A new society and economy can only emerge through the maturation of such action and self-organization – a maturation that requires much more professional leadership than the dominant tendencies in Occupy were willing to admit. Compared to a self-organization-based socialism, a revised New Deal is 1) less than desirable: an autonomy-based socialism might be more chaotic in its initial stages (in regards to delivering goods and services), but it would ensure that the goods and services of socialism are never perceived simply as “entitlements” (as free market conservatives and liberals always worry) and are rather seen as fruits of collective achievement; 2) unlikely: today’s elites are much more resourceful than those of the twentieth century and will not descend from their thrones to make a deal (without a fight). If there is no revolutionary threat, there can be no social democracy; 3) unsustainable. Actually, unsustainability was (and is) the biggest curse of the New Deal (and social democracy in general). It cannot last for more than a few decades, due to two (related) reasons. Social democracy, in all its forms, leaves real power in the hands of the elite (businesses and bureaucrats). The latter grabs more than its fair share of the pie gradually and (whenever it can) abruptly. I am not simply repeating a dogma here. Raising suspicions about a New Deal is not identical to stating “we shall settle for nothing less than pure socialism!” To the contrary, an autonomist socialism should learn to live with some businesses, markets, and bureaucrats (contrary to anarchist, left-wing communist, Stalinist, etc. dreams of abolishing the “enemy” overnight). The question is one of power; and my observation is historical (see below). It is practicality, not just principle, that requires us to look beyond the New Deal. The second factor that renders social democracy problematic is more technical. Those who call for a revised New Deal still base their vision on Keynes. It is indeed true that Keynesian policy tools delivered the great and (relatively more equitable) wealth of the twentieth century (in America and elsewhere). However, as orthodox economists are wont to point out immediately whenever someone brings up the New Deal, Keynesianism inevitably leads to stagflation (in the long run) and other dead ends. What they forget to note, however, is that Keynes was also right: we are all dead in the long run. To tweak Keynes, we could say the following (in the spirit of Karl Polanyi): if we applied orthodox economics persistently enough, it would not end in stagflation, but the death (of civilization and of nature). So, the choice between Keynesianism and orthodoxy is not something to be settled in the classroom (here is where my technical objection differs from that of the orthodox). 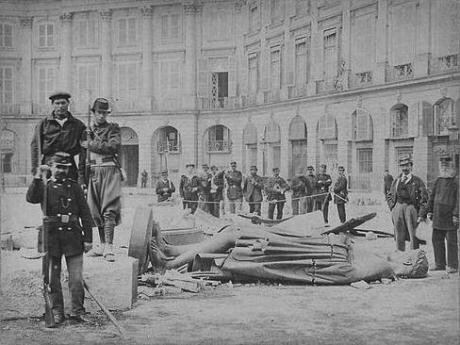 Communards pose with the toppled statue of Napoleon following the destruction of the Vendôme Column on May 8, 1871. Wikicommons/Bruno Braquehais. Some rights reserved.Orthodox and unorthodox tools need to be mixed and matched for effective solutions. We should have learned that lesson after world-powers disastrously implemented orthodox theory from the 1830s to the 1920s (although, as circumstances dictated, less coherently toward the end). The world repeated the insanity of approaching economic orthodoxy once again after the 1970s, not because it was “theoretically” the right thing to do, but because free market liberals and conservatives (empowered by a business counteroffensive) pushed us in that direction. The New Deal had left power in the hands of elites; and they used that power when conditions (the frustrations caused by stagflation) allowed them to do so. Even if socialists controlled policy-making for a few decades, they would run into technical problems (stagflation and more). Since even a revised New Deal would leave the fundamentals of power and property untouched, the elites would again take back all the benefits that would accrue to us during those decades. Only an autonomy-based socialism can prevent such counteroffensives. Examples of such socialism abound in history, but they have always been tried out in less than ideal circumstances (famine, underdeveloped/non-industrialized economies, isolation, and the like). The Paris Commune is the “purest” example, but its vulnerability and brevity taught activists that some (unfortunately hierarchical) organization was necessary to sustain and expand egalitarian practices. The Bolsheviks took that lesson to heart rather more dogmatically than they should have, sowing the seeds of the authoritarianism that would (literally) finish them off only two decades after they came to power. Still, the first decade of the Russian Revolution is rich in self-organizational experiences such as councils, communes, and factory committees (and the Bolsheviks were decisive in both bolstering and repressing them). Chinese, Yugoslavian, North African, and South European histories, among others, are also full of experiments we can learn from. In today’s world, many small and large cooperatives practice the same principles, but lack (political) tents, which prevents them from turning into global projects. Moreover, in a different way, they face the “isolation” problem that the Russian councils suffered from, making it hard for them to stick to egalitarianism. You can’t build socialism on an island (whether that island is Cuba or a single company). The loose talk of socialism in America creates the possibility that we can learn from the past; unite the existing experiments; and create more political and economic venues for a truly democratic socialism. Yes, defeating right-wing radicalism is the most immediate task, and voting for New Dealers (or even free market Democrats) might be a reasonable way to do that in the midterm elections of November 2018. But we can lead better lives in an inhabitable world (for more than just a few decades) only if we chart a less governmental, less voting-based path. Without that counter-balance, even protecting whatever remains of liberal democracy is an empty dream.